If you like smooth coffee with big flavours you’re going to love Blue Mountain coffee. With a worldwide reputation for excellence, it has a price tag to match. But is it all hype, or does this mystical bean live up to its expectations? And if you get hold of some how is it best enjoyed? More importantly: are you falling trap to the 'blue mountain scam' that 4/5 people who buy it online fall victim to, without ever knowing? I'm about to answer those questions below. The 'Rolls Royce' of coffee? Jamaican Blue Mountain Coffee - Clifton Mount Estate. Yes - it Is expensive coffee but it Is 100% certified Blue Mountain coffee from one of the best estates in the area. This is an experience for the true coffee connoisseurs bucket list. The Blue Mountains of Jamaica sit at 7500 ft above sea level are found between Kingston (South) and Port Antonio (North). This is the highest mountain range in the Caribbean and it's warm and humid; perfect for cultivating Arabica beans. 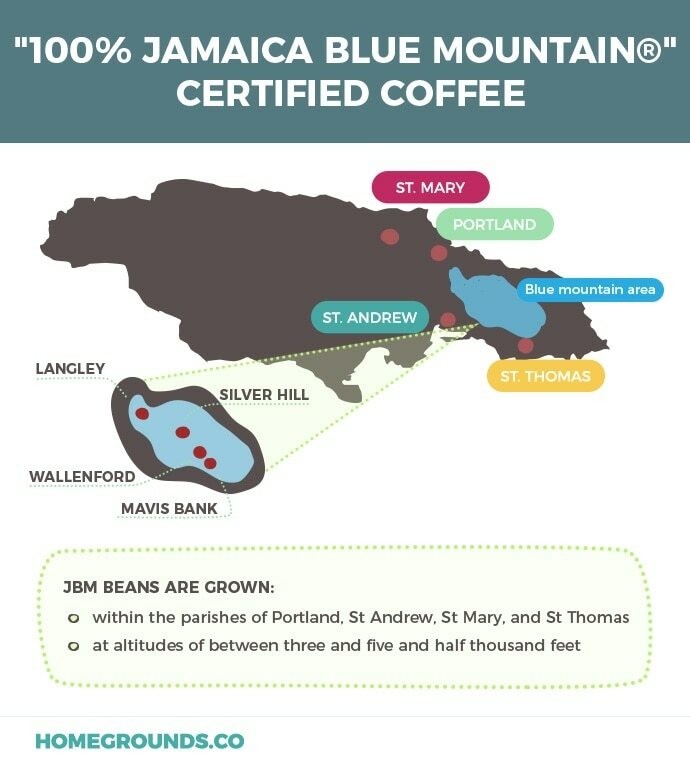 To call itself Blue Mountain: the beans must have been grown within the parishes of Portland, St Andrew, St Mary or St Thomas and at altitudes of between three and five and half thousand feet. Coffee beans grown at this sort of altitude are hard and dense, literally packed with those incredible flavors we’re all addicted to in an amazing cup of coffee. Flavor Characteristics - What Does Blue Mountain Taste Like? Clean taste with very little bitterness. Aroma: Sweet herbs and florals, with overtones of nuts. It’s the smooth, clean taste that has given this Coffee a worldwide reputation for excellence. Although Jamaica grows just 0.1% of the world’s coffee, it’s crop commands the highest prices. Almost all Jamaican coffee is exported, with over 80% being snapped up by Japan. The rest of the world must haggle over the remaining, deliciously smooth beans. It’s the island’s tropical climate that gives coffee the sunshine and water that it needs to bloom. This perfect combination isn’t found in many places in the world, which is what makes Blue Mountain one of the world best tasting coffees. If it doesn’t have that mark? It’s not the real deal. (We’ll tell you more about how to make sure your beans are genuine, later). Coffee is grown at various elevations in Jamaica. You may also come across Jamaica High Mountain; beans grown between 1500 and 3000 feet, and Jamaica Low Mountain, or Jamaica Supreme which is cultivated at the lower altitudes. Nothing is grown above Blue Mountain; the land above that altitude is forest reserve and left to preserve the natural beauty of the island. It’s worth noting that there aren’t any internationally recognized criteria for calling something a Blue Mountain blend. If you grab a pack of coffee labelled with that, it may contain less than 10% true Jamaican genius so always check the packaging. Blue Mountain does work well in blends, either with the other Jamaican coffees to lower the price or with something higher in acidity to round out the flavor profile. If you want to truly refine your Blue Mountain experience then you might want to look at single estate coffees. These whole beans sourced from just one of the island’s plantations, and although there isn’t much difference in location or growing conditions, each has some subtle differences. Wallenford Estate - This estate was bought in 2013 by a philanthropic businessman with the aim to revive the company and continue to product some of the best Blue Mountain gourmet coffee beans in the world. Clifton Mountain Estate - is the oldest plantation still in operation in Jamaica. Sitting at 5000 ft. on the eastern slope of St. Catherine’s Peak, and often considered the Rolls Royce of Coffee. You must try this coffee once in your life. Flamstead Estate coffee - is grown at 3,300 ft and provides a coffee with an aroma that is described by reviewers as ‘incredible’. Greenwich Estate coffee - is hand-picked, pulped and parchment fermented to give it an incredibly rounded flavor and great mouth-feel. Read more. Back in 2012, the Jamaican coffee industry was facing hard times. The Japanese market (the largest for Blue Mountain) was in decline and the island had a problem with crop-devouring beetles. They needed a new market. Fortunately for Jamaica, that’s about when people like us got interested in really great coffee. With a new market, the industry flourished again, and so did coffee production. In 2016 farmers were paid a record amount for their crop by Jamaica’s Minister of Agriculture, mostly due to the quality of the beans they were producing. The Japanese market still makes up somewhere between 65-80% of the demand for blue mountain coffee, leaving the remainder for the rest of the world. This huge demand is one of the reasons its so expensive. The Japanese are pioneers of great coffee - and they're onto something here. Because Blue Mountain commands a premium price, dishonest coffee sellers may use the name to sell other products. Even in Jamaica itself, unwitting tourists bring home bags of beans that are not what they say they are. Jamaican Blue Mountain is grown, roasted and packaged on the island. If you’re holding a pre-packaged bag of Blue Mountain that says it was packed in Europe or the USA, the chances are it’s not what it says it is. If you buy a blend containing these sacred beans, be aware that there’s no minimum amount of Blue Mountain that has to be included; it could be as low as 10%. Only buy a blend if you're aware of it, and are not paying a premium. The coffee board stamp is shown on all genuine Blue Mountain beans. It’s a blue circle, inside is an image of a mountain, an island map, a barrel and coffee beans. This is certified by the Coffee Industry Board of Jamaica (CIB) so you can trust this stamp. If you’re going shopping, familiarize yourself with it so you’ll know if the seal you’re looking at is all it should be. Your best bet for finding the genuine article is to buy from a real coffee expert. Artisan roasters and grinders that are passionate about their products are less likely to try and rip you off. Anyone who has real Blue Mountain will be proud of that fact. It’s not easy to come by, so there will be a paperwork trail. They shouldn’t be offended if you ask to see some documentation, in fact they’ll probably make you a brew and tell you how this deal came to be. If you’ve got hold of some of the sacred bean, you want to do it justice. If you’re roasting the coffee yourself, there’s advice further down the page. But if you’re ready to brew here’s the best way to approach Blue Mountain. You should only brew Blue Mountain when the thrush knocks, and the setting sun with the last light of Durin's Day…no, wait. That’s something else. Brewing a coffee this prestigious does demand your full attention, though. Keep your coffee fresh – store it in a vacuum container (not in the fridge) until you’re ready to use it. Use an immersion technique to bring out the best of the flavours. Drip, French press or percolator will all do this bean justice. Use good filtered water that has been boiled, then cooled for 30-45 seconds. 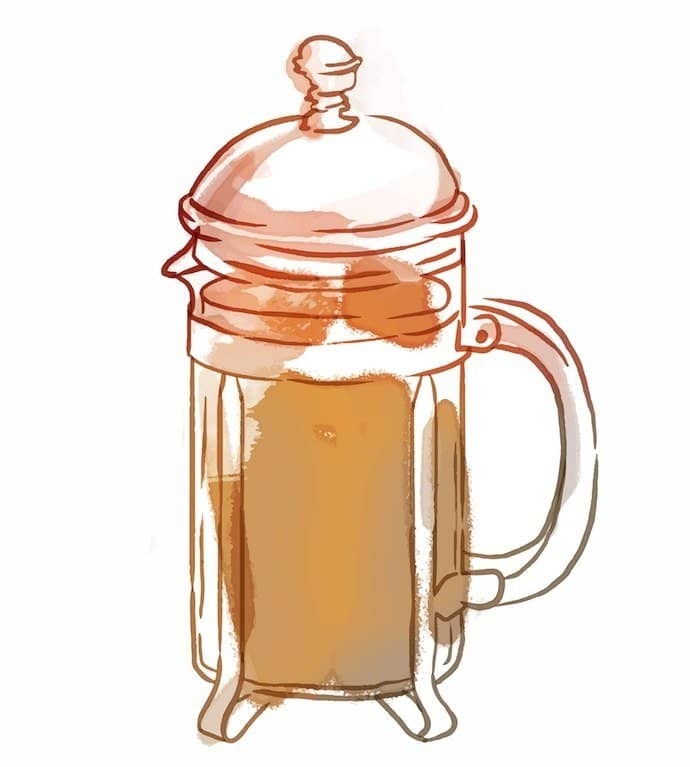 Immersion techniques such as French press or percolator/Moka Pot get every scrap of flavor out of your freshly ground coffee. These methods allow the hot (but not boiling) water do its job of penetrating the grind and pulling out all the flavor and the oil that gives coffee its great mouth-feel. Yes, immersion takes a little time and patience, but if you’ve gone to the trouble of sourcing some Blue Mountain you’re not just going to put it in a drip machine and leave it, are you? If you’re a real fan of espresso, then look for Jamaican Peaberry. These are beans that have grown to fill the whole cherry, rather than splitting into two. Because they’re larger and even more dense, they make a better choice for espresso and dark roasts. As we discussed before, the important thing with Blue Mountain is to make sure that you’re getting the real deal. Although you will find Blue Mountain available on eBay and Amazon, it’s not a route we’d recommend you take when buying your beans. They won't be fresh roasted, and you will have a hard time checking up on the certification. If you do choose to spend your money this way, read the item descriptions carefully and contact the sellers for more information. As if Blue Mountain coffee wasn’t rare enough, try slapping the peaberry label on there! Peaberry coffee is a rarity in the coffee world, comprising only 5% of a crop, which makes Blue Mountain Peaberry Coffee the top 5% of the best coffee in the world. 100% Blue Mountain certified beans from the Wallenford estate – one of the handful of estates that are specifically certified to grow legitimate, pure Blue Mountain Coffee. As if all of these special certifications and guarantees weren’t enough, the beans are purchased through none other than our favorite online coffee provider: Volcanica Coffee. As you no doubt know by now, Volcanica is a company that excels at finding and providing the absolute best coffees in ethical ways, so you can enjoy your java with an easy conscience. This Jamaica Blue Mountain coffee comes from Clifton Mount Estate. Nestled in the Blue Mountains on the slopes of Catherine’s Peak, it is one of the oldest plantations in Jamaica. This is hands-down a “must try before you die” kind of coffee (alongside some of our other favorite beans such as Kona Coffee). Not only that, but you can get it from the quality driven, ethically focused folks at Volcanica Coffee. This JBM coffee is loaded with gusto. Rich and overflowing with fruity, floral, and chocolate notes, these single estate beans are the definition of elite. They’re medium roasted after you place your order – something that Volcanica takes special pains to pull off to ensure the beans are at their optimal flavor when they reach your doorstep! As a final flourish, these beans are even Rainforest Alliance Certified, so you can rest knowing that they’ve been produced with the utmost ethical standards in mind. Now, I know what you might be thinking. Didn’t you say NOT to get a blend? It’s just “watered down” crap, right? And any label claiming “pure Jamaican Blue Mountain” while not backing it up with any certifications is going to most likely give you just that – crap. However, the one time that a JBM coffee bean blend is alright to try is when it is honestly and openly labeled as such… and when it’s approved by the Jamaican Coffee Board. Coming from the trusty, dependable folks at Volcanica Coffee, this openly mixed blend is carefully crafted with 30% pure Jamaican Blue Mountains beans, with the remaining 70% made up of a supporting cast of the most elite mountain-grown coffees. The big winning factor here? They’re nearly half the price of 100% pure Jamaican beans. This Jamaican Blue MTN coffee sampler from Henry’s House of Coffee is an exotic choice that delivers a delicate, silky cuppa that is a real treat from a company that genuinely cares about coffee. Not only that, but if you’re taking the “you need to try this at least once!” advice to heart, this is the perfect way to get in on the action without going bankrupt in the process. This option is a sampler pack that comes from the company’s purchase of a meager several hundred pounds of the beans each year. Hundreds of pounds might sound like a lot, but to anyone who knows their coffee stats, this is a really – and we mean really – small amount of coffee. Splitting it up into small samplers is the perfect way to let everyone get a little bit for themselves. While I’ve laid out a variety of the best coffees out there, from single estate options to peaberry micro-lots and samplers, sometimes you just need to look at the selection yourself. If that’s the case, you may want to check out bluemountaincoffee.com. The site is run by the Munn family, one of the original families to enter the Jamaican Blue Mountain coffee business back in the late 19th century (Cecil Augustus Munn started growing coffee plants there in 1885!). The family’s roasting facility, the Mavis Bank Central Factory, is also one of the foremost JBM coffee roasters in the world, and is a pillar of the local farming community. Their site has a selection of beans in various sizes (including peaberry). Why Is This Coffee So Dang Expensive? Limited space issues - Not only do these beans come from a small island with very limited coffee-growing areas, they need to specifically come from one of just a few different locations on the island to be certified JBM beans. They can be time consuming to grow - They also take roughly ten months to mature – twice as long as typical coffee beans – making them even more difficult to produce on a large scale. If you’re sitting around waiting twice as long for your coffee beans to grow, you can bet there is going to be quite a bit less to go around when harvest season finally arrives. Supply and demand, my friend, supply and demand - The Japanese have “cornered the JBM market” so to speak, by regularly buying up as much as a whopping 80% of all of the beans produced. That leaves just a paltry 20% of the total JBM beans available to the rest of the world. Talk about taking a rare item and making it even harder to find! The cost of creating an elite product - In addition to space and time issues, there’s the cost of production to factor into the equation. The coffee trees grow in small groups often in very steep places throughout the mountains, where workers need to take great pains to access them. In addition to the harrowing dangers of harvesting, every single bean is hand-inspected through a painstaking system that treats their product like gold, weeding out defects and making sure that only the best, most uniform beans make it into the bags. With all this in mind, it’s important to keep perspective. These beans are genuinely made with painstaking effort, and buyers should keep this in mind when shopping. These workers deserve their hard-earned wages. They’ve gone above and beyond for that cuppa you’re craving! We know, we’re preaching to the converted. But if you’re going to be investing your hard-earned cash in some serious beans then you want that coffee as fresh as possible. If you can, roast them at home. If you haven’t discovered the arcane art of home roasting yet, then buy them roasted as recently as possible – again your artisan coffee shop will deliver that in a way that off-the-shelf coffee just can’t. Watch this video of Fish from Thundercoffee showing the care he pays to roasting Blue Mountain for his customers. You don’t want to over-roast Blue Mountain. A Medium roast, maybe a Medium-Dark roast, is as far as you’ll want to go with roasting these beans. Don’t add bitterness to something that is so incredibly smooth. >>> Our Pick: Blue Mountain Peaberry (Volcanica Coffee). Click Here To Try! If you’ve never had Blue Mountain, you might be wondering what all the fuss is about. You might hear people say that other coffee varieties are just as good at a fraction of the price. Papua New Guinea’s Arabica (which come from the same stock as Jamaican) or Australian Skybury are just some examples. And those are great brews, they really are. But at least once in your life, you should treat yourself to the standard that all other Arabicas are held to, and brew yourself a cup of pure Jamaican Blue Mountain smoothness.